Do you want to build a snowman? The answer is yes with these adorable melting snowman cookies, as dreamed up by my own wonderful sister in-law Kaela Sands! Serving them up for Christmas dessert, these melting snowman cookies would be a great treat on the candy table for any Christmas, Winter Wonderland, or even Frozen themed party. Depending on what you feel like, follow your favourite cookie recipe and bake some delicious basic treats. Make sure it is a sugar cookie recipe, or a plain recipe, and for inspiration you could follow the directions from some previous posts of mine like Cute as a Button Cookies, or even the Gingerbread Cookie Wreath if you want a Christmas feel to the cookies. Once you’re done, the real fun begins as it’s time to make the snowman! Using an electric mixer on medium speed, beat the margarine, icing sugar and vanilla essence together until light and fluffy. Using a spatula, splatter the icing sugar onto the cooled cookies and arrange and splatter it like melting snow – the messier the better! Separate the marshmallows onto a plate (the further away the better to avoid sticking together) and put in the microwave for 10 seconds to melt the marshmallows slightly. Remove from the microwave and splat the half-melted marshmallows onto the tops of the cookies, over the icing sugar. Next, use the coloured icing gel pens (or heap the different coloured icing into three separate piping bags) and create designs on the marshmallows and icing sugar the way you would decorate a snowman. Use black gel to create eyes, mouths, arms and buttons; red to create a melting carrot nose; and green for a scarf. 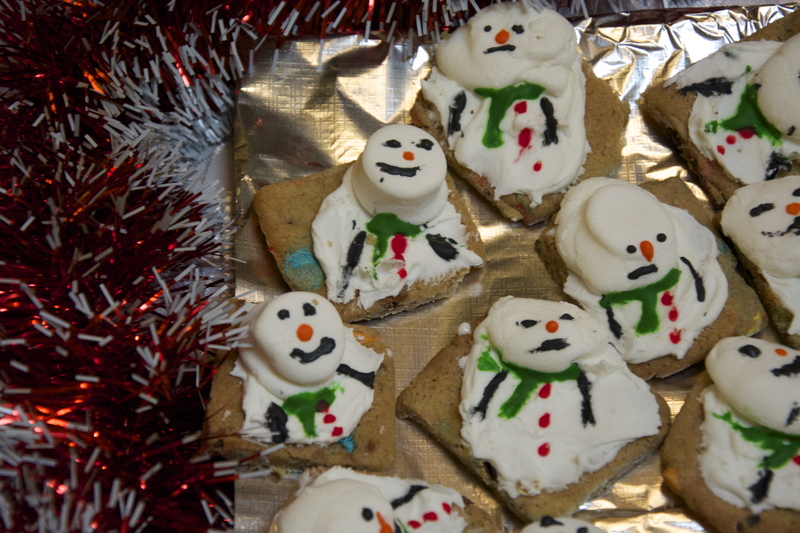 Serve on a crisp white plate surrounded by snowflakes and you have one damn delicious snowman! Let me know if you decide to use this receipe for yourself- my sister in-law would love to see photos! Email them to me at thepartyconnection@hotmail.com or leave them in the page below. Thanks for the awesome idea Kaela – you’re the best!